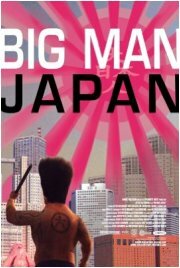 Movie: "Big Man Japan (Dai-Nipponjin)"
Plot: Masaru Daisato is a 40-something milquetoast who leads a fairly normal existence. Most of the time. When giant monsters threaten Japan, however, he makes for the nearest power plant, juices up on electricity, and grows incredibly large to fight them. Review: In the past, I’ve enjoyed mockumentaries like “A Mighty Wind,” “Best In Show”, most of Christopher Guest’s stuff, really. When I heard that there was a new mockumentary out, this time about giant monsters and the men who fight them, you can bet I was anxious to see the result. As the film begins, you may find yourself wondering why the documentary crew is following a seemingly unremarkable man and asking him probing questions about his boring life. The short answer is that Daisato Masaru comes from a long line of men who are able to grow incredibly large when exposed to large amounts of electricity. The government pays Daisato a modest salary, and in return, he occasionally steps up to fill the immense purple shorts of a monster fighter. The film starts out slow, and stays there. Granted, knowing that the mild-mannered man the documentary crew focuses on will turn into a giant half-naked monster fighter at some point might have made me a little impatient. Even so, the film grinds on at an agonizing pace , and you can’t help but notice a lot of little sequences that the movie wouldn’t have suffered without. In particular, the beginning of the film features a sequence wherein Daisato is driving his scooter to the prep site for his big battle. Two solid minutes of watching him drive slowly up a long, winding road. The battle that follows is worth seeing, but still, was it necessary to include that much buildup? There are some funny moments while Daisato is normal-sized, but the bulk of the humor comes from his struggles against the monsters attacking the country. In the very first fight, Daisato tackles a monster with a bad combover who enjoys suplexing office buildings. Later still, he fights a monster consisting of a head sitting atop a single leg. The monster designs alone are bizarre enough to warrant a laugh, but the interaction between the two of them is even more rewarding. Daisato isn’t a particularly skilled combatant, and in spite of the destruction the monsters cause, you get the feeling that no one really cares all that much about what Daisato does (a point that the documentary crew drives home with a few street interviews with people who watch the TV show based on Daisato’s fights). Apart from the pacing of the film, my only other complaint is that the entirely CGI giant Daisato looks fake. The monsters, also entirely CGI, can pull it off because you don’t really have a picture in your head of what a real combover suplex monster would look like, but Daisato looks just like his normal-sized self, albeit half naked and with a fatter neck. On the bright side, it isn’t so noticeable that you can’t focus on his awkward monster fights. When Big Man Japan is funny, it is really funny, even during the ending sequence that is so bizarre, even the protagonist doesn’t know what to make of it. The problem is that there is a lot of time in between those funny moments where you’ll just be bored. The boring nature of Daisato’s everyday life helps emphasize the dry humor, but the ratio of boring crap to dry humor is just a little too high. That alone is what’s stopping the film from being really great. I saw the trailer for this movie a while back on TV and realized that it was nothing I really wanted to lay my eyes on. Despite the fact that I do find realistic that a man who suddenly grows up is supposed to rip his clothing to shreds, looking at the images made me find the flick rather disturbing. I've been looking forward to seeing this for a few months, glad to see its out now. I wouldn't mind watching this. I read people raving about it on Rotten Tomatos and I wanted to find a copy. No luck yet as my local rental shop is douche central so blrrrpptt!!! Oh Yeah - another great one I want to own is one I saw at an Indy theater years ago - it's called InfraMan. Japanese superhero battling giant monsters like the BeastyBoys film clip did tribute to. Readers of this site will love it - check it out. Gotta be worth at least a look.